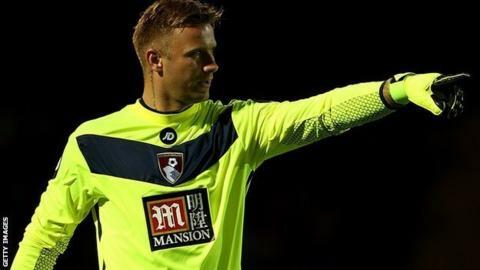 Bournemouth manager Eddie Howe says he is unsure how long goalkeeper Artur Boruc will be ruled out with a thigh injury following initial scans. The Poland international, 35, had to withdraw during the warm-up at Manchester City on Saturday. Boruc is the latest in a number of first-choice players who are sidelined with injury for the Cherries. "We're still waiting on the diagnosis to see how long he's going to be out for," Howe told BBC Radio Solent. "Certainly, I hope we caught it before it got too serious. It was a strange one as we had to pull him out so close to kick-off. "He felt a pain as he did one of his longer kicks in the warm-up just before coming into the dressing room. "We didn't want to take any chances that it could turn into a bigger pull or a longer time out." Bournemouth's injury list includes long-term knee ligament recoveries for striker Callum Wilson, winger Max Gradel and defender Tyrone Mings. Club captain Tommy Elphick has also been ruled out until the new year after the defender had an operation on his ankle. Midfielder Andrew Surman is expected to recover from a calf injury sustained against Manchester City in time for Sunday's Premier League game against Tottenham.